So this past Sunday was really a banner day for me birding and photographing birds in Queens. In addition to the Scarlet Tanager and Wilson’s Snipe I also managed to get to the waterhole to see a Philadelphia Vireo found by Seth Ausubel, a stellar Queens birder, before I arrived. The bird had made two appearances before I got there and made a third within ten minutes of my showing up. 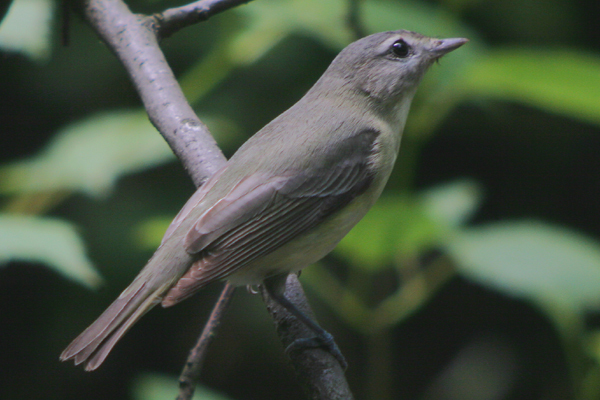 It was impressive that Seth managed to call it and call it correctly because it was a very drab Philadelphia Vireo, with barely any yellow on the chest and at some angles its lores did not look as dark as one would expect. 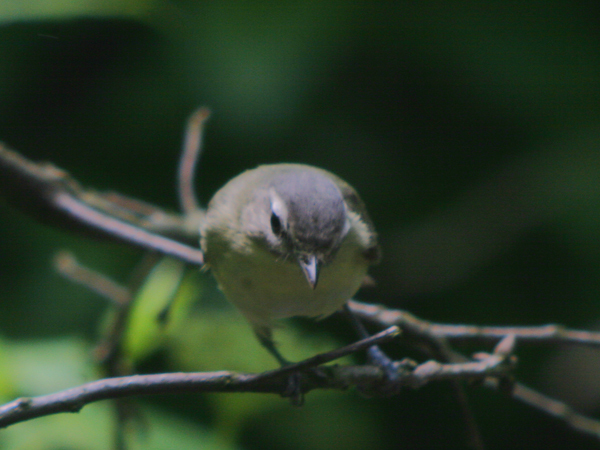 In other words, had I seen the bird I probably would have called it a Warbling Vireo and moved on so I am glad that a better birder than I found the vireo! The yellow throat, and yellow breast with brightest yellow in the center (seen in the field, not easily in the photos) is also diagnostic. 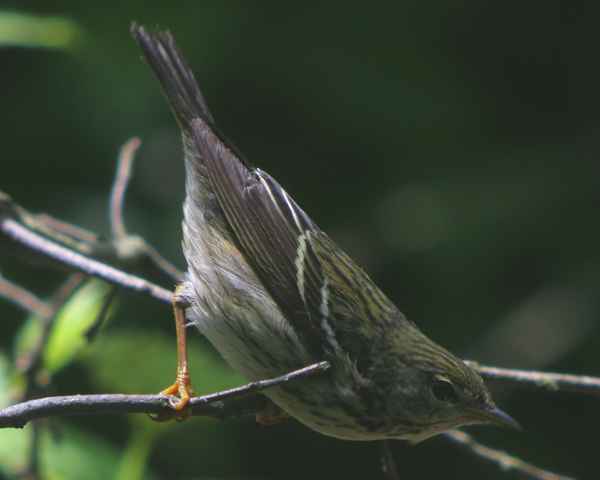 The green back contrasting with darker wing, grayish head, and yellowish undertail coverts are additional identification points. Another interesting point of Philadelphia Vireo plumage is that the brightest birds, in terms of the yellow on the chest, are juvenile birds in fall. Older birds are duller, which is pretty much the opposite of what I would have expected. It was nice to add a new bird to my Queens list and even nicer to learn the finer points of Philadelphia Vireo identifying from Seth, Eric, and Dave, a trio of birders that humble the heck out of this relative novice. Below is one more shot of the cool and cooperative little bird in which I enhanced the color saturation so the yellow of the chest stands out a bit more than it otherwise would. But the title of this post hinted at more birds than just a Philadelphia Vireo at the waterhole and other birds I shall share. 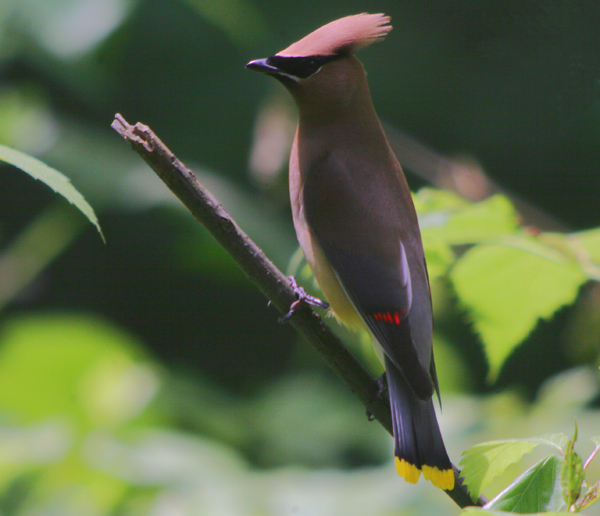 How about a Cedar Waxwing, one of many that has hung about Forest Park of late? 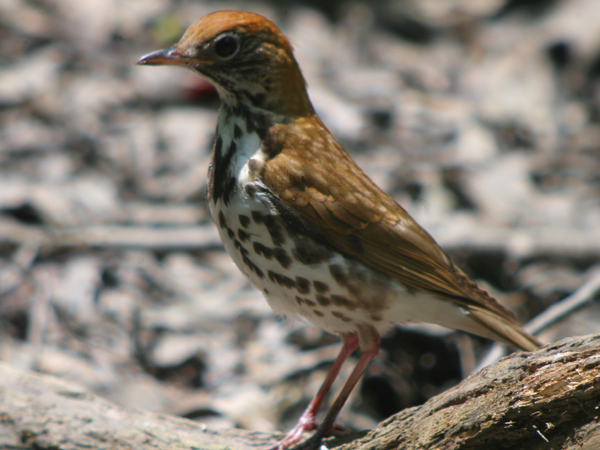 Or a Wood Thrush, not as handsome as his voice is beautiful but not looking bad in his brown and rufous with dark-spotted white underparts? Myself, I am always partial to wood-warblers, even the generally more muted females, like the female Blackpoll Warbler in the next two shots. I just love Blackpoll Warbler feet, so bright in the spring, and so dull in the fall, but always light, a great field mark when they are just another confusing fall warbler. Below is a male, brighter and more contrasty than the female, but I think that in Blackpoll Warblers the females are more pleasing to the eye. Something about those subtle shades of streaked green just make them more attractive. That’s all for now, but I would like to point out that all of the above shots were taken in less than an hour between roughly 11:45 AM and 12:30 PM, the hottest and normally the slowest time of day. And I didn’t even include the lousy shots of a female Baltimore Oriole (messed up the focus) or the female Eastern Towhee (messed up the exposure) and I didn’t mention at all the American Redstart, Ovenbird, Red-eyed Vireo, Chestnut-sided Warbler, or Indigo Bunting that also visited the waterhole while I was there. Living ten minutes from an urban oasis certainly has its privileges! A Philly Vireo, despite its name, is a rare spring sighting on the east coast for sure. 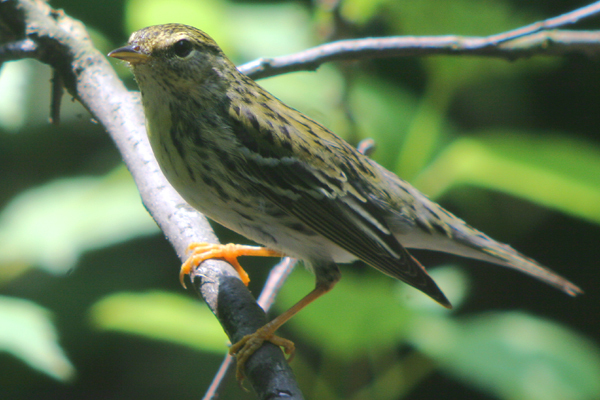 They typically migrate more inland in the spring and then more coastal in the fall, like a Conn Warbler. I’ve only seen one myself in the spring. Nice! At least a few Philly’s should pass through the region in Spring as they do breed from the Adirondacks of NY through Northern New England, but I agree with Patrick that they are much more common in the Fall than Spring, although not nearly as rare in Spring on the coast as Conn. Warbler.